Olivia was born in Taraz, Kazakhstan. She joined our family through a disrupted adoption in December of 2008, when she was eight years old. We had previously known about Olivia because we had advocated for a family for her since she was a toddler. Olivia was born with the same medical condition as our daughter Rachel. Both girls have Arthrogryposis, which affects all their limbs and all their joints. 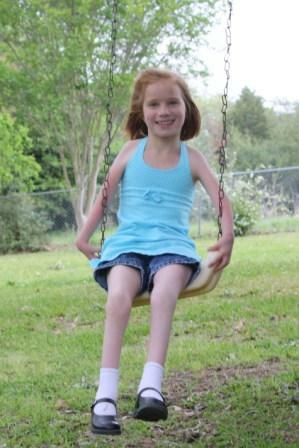 Like Rachel, Olivia was also born with a dislocated hip, clubbed feet, and numerous other issues associated with AMC. This is such a rare medical condition that it is amazing that we have two daughters, only a month apart with the same condition. The good think about Arthrogryposis is that it is the worst it will ever be when the child is an infant. Castings and many surgeries can sometimes help a child with AMC gain mobility and function. 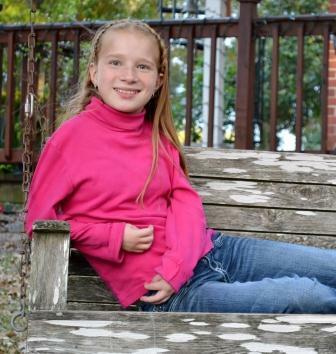 When Olivia first joined our family, the biggest challenge we faced was that she had taken Arthrogryposis as her identity. She loved the attention that she received for being handicapped. This was something that we had never experienced with a child before. Rachel was so determined to do everything that the doctor’s told us she would never be able to do. It is interesting how differently they view the medical condition. As I’ve watched Olivia over the past year, I’ve realized that Rachel and Miriam Grace have been one of the greatest gifts she will ever receive. Although Olivia has tried to gain their sympathy, they have treated her just like any other girl their age. Miriam Grace is always willing to help Rachel or Olivia, but she also realizes that helping Olivia starts with Olivia being willing to help herself. It is really important that Olivia learn to be independent because she has a lifetime ahead of her, and even through things can to done to help improve her medical condition, it is something that will never be completely corrected. Interestingly, Olivia has much stronger legs, but weaker arms than Rachel. This has posed some challenges for her when it comes to taking care of herself. Even though it has been difficult for her, she has learned to do so many things that she was unable to do when she first joined our family. During her first days with us, I remember feeling very frustrated. We had even talked about how parenting her felt somewhat like it must have been to parent Helen Keller. She would throw fits to see if we would respond. She would say “I can’t” to everything we asked her to do. One day a friend of mine, Teresa Blake, who also happens to be an adoptive mother, came by to visit. It was her first time to really be around Olivia and it was obvious that Olivia was trying to show her just how bad she could be, and I was at a point of exhaustion from dealing with her. We were preparing lunch, when Olivia through a fit because she couldn’t get the back door opened and she wanted to go outside to play. I let her struggle for a long time and then I turned to go get the door. Teresa looked me straight in the eyes and said, “No, she can do this.” I immediately realized that Teresa was right. Shortly after, Olivia managed to get the door open and headed outside. After lunch was ready, Olivia told Miriam Grace (in a very matte r of fact way) to get her a cup of water. Miriam Grace told her, “no” and headed to the table. As I turned to get the water for her, Teresa’s eyes caught mine again. I knew she was right. I was allowing this little girl to take control of our family and manipulate us into doing everything for her. I told Olivia that she needed to learn to get her own cup of water. She did not like the idea, but realized that this was not a time to try and negotiate. Have you ever seen your child do something that you were pretty sure she did on purpose, but was so good at it that you questioned whether or not it was an accident? Well, that’s exactly what Olivia’s next move was! She dropped the cup of water and it splattered all over the floor and cabinets. As I grabbed the towel to clean up the mess, Teresa grabbed my hand and said, “No, she did it and she can clean it up herself.” Sometimes it takes having a good friend who can see what is happening for us to realize the mistakes we are making. From that day forward, Olivia has had to learn to be more independent because everyone in our family realized that it was her only hope for helping herself. Olivia was also very far behind in school when she first came to us. This was understandable with the challenge of learning a new language in addition to all the school she had missed due to surgeries etc. It has taken some work and lots of patience, but Olivia is getting really close to being on target in her academics. I think it has been a good challenge for her to try and catch up to the same level that Rachel and Miriam Grace are at. She still has some work to do to get there, but she is making huge steps in that direction. 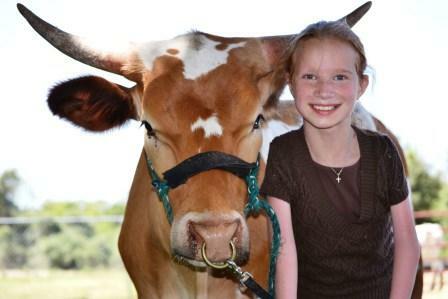 In October of 2009, Olivia had the opportunity to show a calf independently at the State Fair of Texas. It took just the right calf and lots of practice at home for this to become a reality for her. 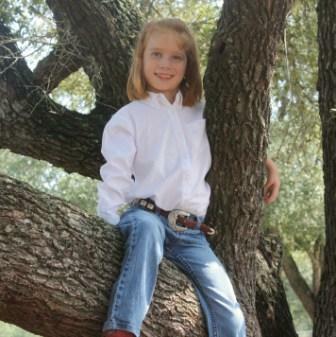 To our surprise, her calf won his class and she received her first belt buckle. She had the biggest smile I’ve ever seen. She was so proud of her accomplishment and I could tell immediately that it did a lot of good for her self-esteem. After the show was over, a friend of mine came up to me and said the lady next to her said, “I bet the Faske’s have never had a challenging day in the raising that little girl.” My friend knew the struggles we had, so she just laughed and said, “Oh, I think they’ve had more than one challenging day with her.” It was really encouraging for us to realize that Olivia is really learning to fit in and become a typical little girl with an identity that is more than just the “handicapped child.” She is learning to make friends in a healthy way, and to seek attention for positive behavior rather than negative. We are so proud of how far she has come.